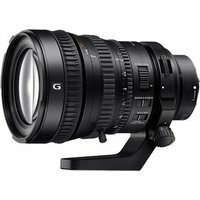 The Sony FE 28-135mm f4 G PZ OSS is a wide-angle to telephoto zoom lens for use on Sony's full-frame and APS-C E-mount mirrorless cameras. Designed for serious still shooters and film makers, the power zoom lens is equipped with Sony's new 'Smooth Motion Optics' design, which addresses three issues of prime concern for movie-makers: change in angle of view (breathing') while focusing, focus shifts during zoom, and movement of the optical axis during zoom. The lens also has three separate control rings for precise, manual control over focus, zoom and aperture. The power zoom is driven by the SSM (Super Sonic wave Motor) drive which allows for control over the speed of the zoom, and ensures the movement is quiet and smooth.